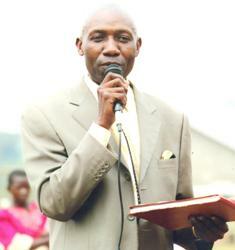 Prince Dr. Peter Mutebi is the founder and President of Peter Mutebi Ministries, Home of Champions Orphanage centers. The King's Church, Jacob water wells project and many other ministries. I (Dr. Peter Mutebi) was very much touched by the kind of life the children were living in there in Uganda and across the globe. As a result of that I was strongly convinced by God to start Home of Champions (Orphanage Center) to help the orphan, disabled and suffering children. At the same time, we grew up not in a very nice environment but I struggled to have education. I remember telling God during that time, that when I grow up and you give me money, I will help suffering children and God helped me. Now I have seen these kids calling me Uncle, Dad and a friend, I have seen them grow up and getting better, becoming Champion every single day in many areas of life. Many friends of ours from U.S.A, Korea, Uganda, Africa etc have partnered with us to make this dream a reality. Thank you so much my friends, partners, mentors for helping us to raise these kids with all your endless support and many Blessings to you.